Sooner or later the doorbell will ring or somebody will tap on your door. You open it and there will be your neighbour. This is especially true if you live in an apartment block, even more likely if you live in a more traditional area of Istanbul. I am not sure about those new complexes with independent villas. I’m guessing it doesn’t happen there. But you open the door and for sure there she’ll be, beaming at you and offering you some wonderful Turkish delight. I love this custom because it hails back to old times, old neighbourhoods and old patterns when sharing was a way of life. This happened to me two evenings ago. There was Müjgan (her name means Gift) and she had made aşure that afternoon. Not only for us but for the entire building. 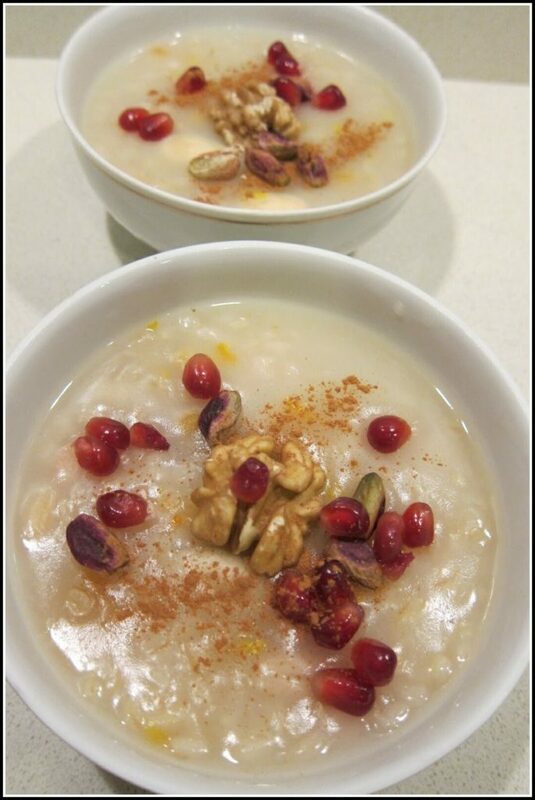 Now this is one of Turkey’s oldest and most traditional of desserts, known as it is as Noah’s Pudding or Noah’s Dessert. It will contain at least 15 ingredients reflecting those items that were left when the Ark came to rest on Mount Ararat after the Great Flood. However their supplies were exhausted so whatever they could find went into the making of this dessert. They were so overjoyed at having survived that they wanted to celebrate with a very special pudding. As a result, it includes different grains, dried fruits, and nuts. 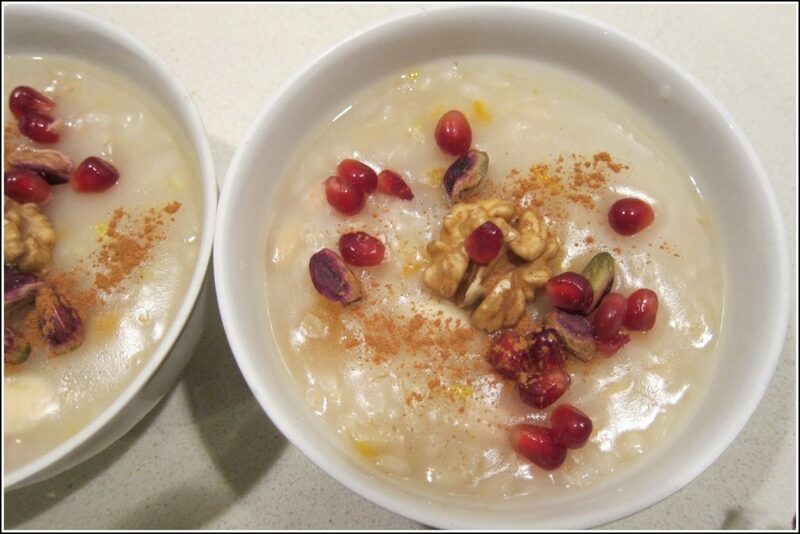 The consistency is porridge-like but the presentation is beautiful, decorated as it is with nuts and pomegranate seeds. Traditionally it is made in large quantities to be distributed amongst family and neighbours during the month following Kurban Bayramı, the Sacrifice Holiday, which is a moveable feast. This past year it occurred in November. What I liked about Müjgan was that she said apologetically that she got confused about the right time to make it but she just felt like making it, so here it was. Actually aşure is not my favourite. It tastes all right but is more of a curiosity than a true gourmet offering in my opinion. But the point is that the custom doesn’t stop here: when a neighbour gives you something on a plate, you must never return that plate empty. That would be ayıp or just not done. I have lived here so long that I feel this acutely. You have to put something back on that plate and then return it. Yesterday I went to a coffee morning where we had fun decorating cupcakes for Valentine’s Day. Our wonderful resourceful American hostess wrapped several in cellophane for each of us and tied them up with ribbon to take home. So this lovely-looking packet is what I put in the 2 clean dishes that I returned to Müjgan. I told her that we had made them that day for Sevgiler Günü and she valiantly declared that she would give them to her own sevgili or darling! I can only hope that he liked them! I've had hundreds of knocks on the door since I moved to Turkey, and lots of different types of food to sample. It's a lovely tradition and one that I often do myself. Every time I bake cakes or cookies I share them around with my neighbours. I learned pretty quickly about never returning the plate empty and even if you don't offer something you've made yourself, fruit from your garden or chocolate is always welcome. I've never been very keen on aşure. I do find with most puddings that the Turks make that they are far too sweet. Ah, Asure is absolutely my favorite pudding. But, how do you make it at home? I could not see the recipe. Did I miss something? Ersin O. It's so lovely to get all your comments. Yes, it is such a sweet custom although sometimes it catches you without anything to give back and you have to think of something! Ersin! I included a link to an aşure recipe so if you click on the word aşure which appears in green in the second to last paragraph, you will go whirling off to a recipe!! Is it really your favourite?? There's obviously a cultural divide there!! Hi MyAnkara! thanks for that, good for you that you make it and like it!! I certainly don't dislike it but I would never make it. I adore Asure – wish M&S would have it !! Hi Felcy! Thanks for coming by my blog and thank you for commenting! Yes, the idea here is very nice.